Despite my dazzling array of ideas at the start of the year, the sandwich/leftover rut always rears its boring head at some point. The rainbow challenge issued by Son and Heir’s kinder has given me the kick up the rear I need to move past it. In keeping with both the rainbow theme and the wet miserable weather that has enveloped Melbourne over the past few days, I’ve made these protein packed little lunches that were just as quick to throw together as sandwiches. Cooking time excepted. 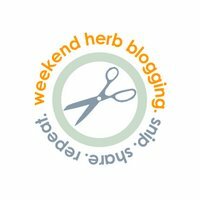 Just to be fancy, I thought I’d throw this one in the ring for Weekend Herb Blogging too as I’ve gone a little coriander (cilantro) crazy. Which is hosted by the fabulous Cate at Sweetnicks this week. As it was Kalyn’s post on Blogher that inspired this concoction it only seems fitting. If you’re one of the coriander haters, you could substitute with Thai basil or mint instead. The flavour would be different but it would still work. You many notice that I have included the coriander roots in this recipe. Cooking the roots adds a fabulous flavour kick. If you haven’t tried it before, I highly recommend it in all your recipes that include fresh coriander. Preheat oven to 200 degrees. Grease a 6 hole muffin pan. Place all meatloaf ingredients in the thermomix or a food processor. Blend until combined and bamboo shoots are cut small. That’s 5 seconds on speed 7 in the thermomix. Divide mixture evenly into muffin pan and smooth the tops. Bake for 25 minutes. Let stand for 5 minutes. Very finely slice or shred or vegetable ingredients. Soak vermicelli noodles in boiling water for 5minutes. Drain and cut into small lengths with kitchen scissors. Toss noodles and vegetables together. Finally, toss through sweet chilli sauce, fish sauce and coriander leaves. 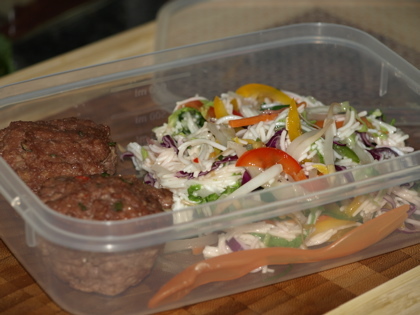 Serve meatloaves on top of salad. mmmm that looks so yum!!! It does sound very tasty, especially the salad! I agree it can be a real challenge to come up with interesting lunches to pack. Will you do me a favor and add a link somewhere in your post for Sweetnicks, (http://sweetnicks.com/weblog/) as that’s the blog who’s hosting this week. Thanks! This sounds like a wonderful lunch or dinner! 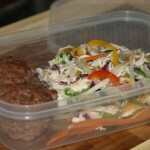 Deborah Dowds last blog post..Where’s the Beef? A person made great points there. in order to do research on the actual topic and found many people may agree together with blog.